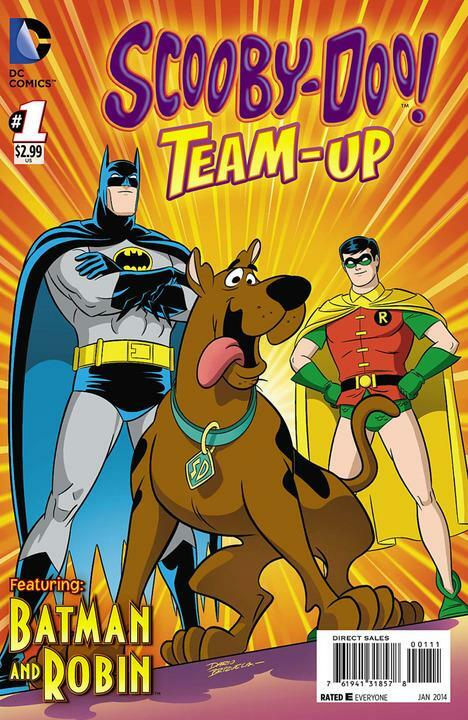 Scooby and the gang go to Gotham City to investigate monster sightings, and wind up working with Batman and Robin to pursue the source of the sightings, the Dynamic Duo's old foe Man-Bat. I am planning on reading the rest of this series in order to determine which stories can fit into CU continuity and which cannot. It's probably safe to say the ones featuring the Super Friends, the animated version of the Teen Titans, and Secret Squirrel don't take place in the CU. This story takes place a few years after The New Scooby-Doo Movies, and Fred refers to Mystery Inc. and Batman and Robin previously encountering the Joker and the Penguin. Is this the first appearance of Man-Bat in the CU? I assumed that you would have to take issues of this series on a case by case basis. While you're at it, you should definitely check out "Scooby-Doo: Mystery Inc." This unique interpretation of the "Scooby-Doo" franchise features a wide variety of creatures and characters that could potentially fit it within the CU. *In "The Dragon's Secret", a creature resembling a Mogwai appears in a Chinatown pawn shop. *In "The Secret Serum", Velma’s mother can be heard discussing the whereabouts of an order of rat-monkeys from Skull Island. *In "The Hodag of Horror", the Lament Configuration from "Hellraiser" is seen in Sheriff Stone's office (complete with Pinhead's disembodied voice) and Jason Voorhees’ hockey mask is seen in the cabinet of curiosities. *The episode "Pawn of Shadows" establishes Quest Research Laboratories as part of its universe and the cast of "Jonny Quest" makes a cameo appearance during a flashback QRL later appears again in "Heart of Evil", which tells the origin story for alternate versions of Blue Falcon and Dynomutt. The villainous Dr. Zin from "Jonny Quest" also appears. There's a lot more where that came from, but I'll leave that for you to decide. Out of curiosity, which "Scooby-Doo" series do you count as canonical? I can't imagine "A Pup Named Scooby-Doo" or any of the cartoons featuring Scappy as taking place in the CU. I think all of the old series from the sixties or seventies are more or less canon in the CU. I think Mystery Inc. is consider an AU. I imagine "A Pup" is also AU. But Sean can correct me if I am wrong. "Mystery Inc." is an odd series when it comes to continuity. It makes direct references to episodes from the original series, but the show itself ends with a time paradox, creating an alternate reality that closely resembles the original series. There's also the matter regarding "What's New, Scooby-Doo?" and the direct-to-video films. They take place about a decade after the original series, but they regard the cartoons featuring Scrappy as non-canon. "Zombie Island" is also treated as the gang's first actual encounter with supernatural forces, which serves to further disregard the Scrappy-centered cartoons. If the 1979 TV special "Scooby Goes Hollywood" is anything to go by, the Mystery Gang themselves have been staring in television shows based on their escapades. And throughout the special, Shaggy is trying to promote a series of films starring him and Scooby exclusively, which sound suspiciously like the films released shortly afterwards like "The Boo Brothers", "Ghoul School", and "The Relectant Werewolf".